10 A None No Power Seat 10 A is a Business Class Open Suite located at a bulkhead. The seat converts to a flat bed. The proximity to the lavatory and galley area might be bothersome. 10 D None No Power Seat 10 D is a Business Class Open Suite located at a bulkhead. The seat converts to a flat bed. This seat, if paired with the one adjacent, is ideal when traveling with a companion. A bassinet for a passenger traveling with an infant is also available here. The proximity to the lavatory and galley area might be bothersome. 10 G None No Power Seat 10 G is a Business Class Open Suite located at a bulkhead. The seat converts to a flat bed. This seat, if paired with the one adjacent, is ideal when traveling with a companion. A bassinet for a passenger traveling with an infant is also available here. The proximity to the lavatory and galley area might be bothersome. 10 K None No Power Seat 10 K is a Business Class Open Suite located at a bulkhead. The seat converts to a flat bed. The proximity to the lavatory and galley area might be bothersome. 11 A None No Power Seat 11 A is a Business Class Open Suite. The seat converts to a flat bed. 11 D None No Power Seat 11 D is a Business Class Open Suite. The seat converts to a flat bed. This seat, if paired with the one adjacent, is ideal when traveling with a companion. 11 G None No Power Seat 11 G is a Business Class Open Suite. The seat converts to a flat bed. This seat, if paired with the one adjacent, is ideal when traveling with a companion. 11 K None No Power Seat 11 K is a Business Class Open Suite. The seat converts to a flat bed. 12 A None No Power Seat 12 A is a Business Class Open Suite. The seat converts to a flat bed. 12 D None No Power Seat 12 D is a Business Class Open Suite. The seat converts to a flat bed. This seat, if paired with the one adjacent, is ideal when traveling with a companion. 12 G None No Power Seat 12 G is a Business Class Open Suite. The seat converts to a flat bed. This seat, if paired with the one adjacent, is ideal when traveling with a companion. 12 K None No Power Seat 12 K is a Business Class Open Suite. The seat converts to a flat bed. 14 A None No Power Seat 14 A is a Business Class Open Suite. The seat converts to a flat bed. 14 D None No Power Seat 14 D is a Business Class Open Suite. The seat converts to a flat bed. This seat, if paired with the one adjacent, is ideal when traveling with a companion. 14 G None No Power Seat 14 G is a Business Class Open Suite. The seat converts to a flat bed. This seat, if paired with the one adjacent, is ideal when traveling with a companion. 14 K None No Power Seat 14 K is a Business Class Open Suite. The seat converts to a flat bed. 15 A None No Power Seat 15 A is a Business Class Open Suite. The seat converts to a flat bed. 15 D None No Power Seat 15 D is a Business Class Open Suite. The seat converts to a flat bed. This seat, if paired with the one adjacent, is ideal when traveling with a companion. 15 G None No Power Seat 15 G is a Business Class Open Suite. The seat converts to a flat bed. This seat, if paired with the one adjacent, is ideal when traveling with a companion. 15 K None No Power Seat 15 K is a Business Class Open Suite. The seat converts to a flat bed. 16 A None No Power Seat 16 A is a Business Class Open Suite. The seat converts to a flat bed. 16 D None No Power Seat 16 D is a Business Class Open Suite. The seat converts to a flat bed. This seat, if paired with the one adjacent, is ideal when traveling with a companion. 16 G None No Power Seat 16 G is a Business Class Open Suite. The seat converts to a flat bed. This seat, if paired with the one adjacent, is ideal when traveling with a companion. 16 K None No Power Seat 16 K is a Business Class Open Suite. The seat converts to a flat bed. 17 A None No Power Seat 17 A is a Business Class Open Suite. The seat converts to a flat bed. 17 D None No Power Seat 17 D is a Business Class Open Suite. The seat converts to a flat bed. This seat, if paired with the one adjacent, is ideal when traveling with a companion. 17 G None No Power Seat 17 G is a Business Class Open Suite. The seat converts to a flat bed. This seat, if paired with the one adjacent, is ideal when traveling with a companion. 17 K None No Power Seat 17 K is a Business Class Open Suite. The seat converts to a flat bed. 18 A None No Power Seat 18 A is a Business Class Open Suite. The seat converts to a flat bed. The proximity to the galley and lavatory area might be bothersome. 18 D None No Power Seat 18 D is a Business Class Open Suite. The seat converts to a flat bed. This seat, if paired with the one adjacent, is ideal when traveling with a companion. The proximity to the galley and lavatory area might be bothersome. 18 G None No Power Seat 18 G is a Business Class Open Suite. The seat converts to a flat bed. This seat, if paired with the one adjacent, is ideal when traveling with a companion. The proximity to the galley and lavatory area might be bothersome. 18 K None No Power Seat 18 K is a Business Class Open Suite. The seat converts to a flat bed. The proximity to the galley and lavatory area might be bothersome. 30 D None No Power Seat 30 D is a shell style Premium Economy seat located at a bulkhead. There is no floor storage for use during take-off and landing. A bassinet for a passenger traveling with an infant is also available here. The proximity to the galley and lavatory area might be bothersome. 30 E None No Power Seat 30 E is a shell style Premium Economy seat located at a bulkhead. There is no floor storage for use during take-off and landing. A bassinet for a passenger traveling with an infant is also available here. The proximity to the galley and lavatory area might be bothersome. 30 G None No Power Seat 30 G is a shell style Premium Economy seat located at a bulkhead. There is no floor storage for use during take-off and landing. A bassinet for a passenger traveling with an infant is also available here. The proximity to the galley and lavatory area might be bothersome. 31 A None No Power Seat 31 A is a shell style Premium Economy seat located at a bulkhead. There is no floor storage for use during take-off and landing. A bassinet for a passenger traveling with an infant is also available here. The proximity to the galley and lavatory area might be bothersome. 31 C None No Power Seat 31 C is a shell style Premium Economy seat located at a bulkhead. There is no floor storage for use during take-off and landing. A bassinet for a passenger traveling with an infant is also available here. The proximity to the galley and lavatory area might be bothersome. 31 D None No Power Seat 31 D is a shell style Premium Economy seat. 31 E None No Power Seat 31 E is a shell style Premium Economy seat. 31 G None No Power Seat 31 G is a shell style Premium Economy seat. 31 H None No Power Seat 31 H is a shell style Premium Economy seat located at a bulkhead. There is no floor storage for use during take-off and landing. A bassinet for a passenger traveling with an infant is also available here. The proximity to the galley and lavatory area might be bothersome. 31 K None No Power Seat 31 K is a shell style Premium Economy seat located at a bulkhead. There is no floor storage for use during take-off and landing. A bassinet for a passenger traveling with an infant is also available here. The proximity to the galley and lavatory area might be bothersome. 32 A None No Power Seat 32 A is a shell style Premium Economy seat. 32 C None No Power Seat 32 C is a shell style Premium Economy seat. 32 D None No Power Seat 32 D is a shell style Premium Economy seat. 32 E None No Power Seat 32 E is a shell style Premium Economy seat. 32 G None No Power Seat 32 G is a shell style Premium Economy seat. 32 H None No Power Seat 32 H is a shell style Premium Economy seat. 32 K None No Power Seat 32 K is a shell style Premium Economy seat. 33 A None No Power Seat 33 A is a shell style Premium Economy seat. 33 C None No Power Seat 33 C is a shell style Premium Economy seat. 33 D None No Power Seat 33 D is a shell style Premium Economy seat. 33 E None No Power Seat 33 E is a shell style Premium Economy seat. 33 G None No Power Seat 33 G is a shell style Premium Economy seat. 33 H None No Power Seat 33 H is a shell style Premium Economy seat. 33 K None No Power Seat 33 K is a shell style Premium Economy seat. 34 A None No Power Seat 34 A is a shell style Premium Economy seat. 34 C None No Power Seat 34 C is a shell style Premium Economy seat. 34 D None No Power Seat 34 D is a shell style Premium Economy seat. 34 E None No Power Seat 34 E is a shell style Premium Economy seat. 34 G None No Power Seat 34 G is a shell style Premium Economy seat. 34 H None No Power Seat 34 H is a shell style Premium Economy seat. 34 K None No Power Seat 34 K is a shell style Premium Economy seat. 40 A None No Power Seat 40 A is a standard Economy Class seat located at a bulkhead and might have additional legroom. There is no floor storage for use during take-off and landing. The tray table is in the armrest making the armrest immovable and slightly reducing seat width. A bassinet for a passenger traveling with an infant is also available here. 40 B None No Power Seat 40 B is a standard Economy Class seat located at a bulkhead and might have additional legroom. There is no floor storage for use during take-off and landing. The tray table is in the armrest making the armrest immovable and slightly reducing seat width. A bassinet for a passenger traveling with an infant is also available here. 40 C None No Power Seat 40 C is a standard Economy Class seat located at a bulkhead and might have additional legroom. There is no floor storage for use during take-off and landing. The tray table is in the armrest making the armrest immovable and slightly reducing seat width. A bassinet for a passenger traveling with an infant is also available here. 40 D None No Power Seat 40 D is a standard Economy Class seat located at a bulkhead and might have additional legroom. There is no floor storage for use during take-off and landing. The tray table is in the armrest making the armrest immovable and slightly reducing seat width. A bassinet for a passenger traveling with an infant is also available here. 40 E None No Power Seat 40 E is a standard Economy Class seat located at a bulkhead and might have additional legroom. There is no floor storage for use during take-off and landing. The tray table is in the armrest making the armrest immovable and slightly reducing seat width. A bassinet for a passenger traveling with an infant is also available here. 40 G None No Power Seat 40 G is a standard Economy Class seat located at a bulkhead and might have additional legroom. There is no floor storage for use during take-off and landing. The tray table is in the armrest making the armrest immovable and slightly reducing seat width. A bassinet for a passenger traveling with an infant is also available here. 40 H None No Power Seat 40 H is a standard Economy Class seat located at a bulkhead and might have additional legroom. There is no floor storage for use during take-off and landing. The tray table is in the armrest making the armrest immovable and slightly reducing seat width. A bassinet for a passenger traveling with an infant is also available here. 40 J None No Power Seat 40 J is a standard Economy Class seat located at a bulkhead and might have additional legroom. There is no floor storage for use during take-off and landing. The tray table is in the armrest making the armrest immovable and slightly reducing seat width. A bassinet for a passenger traveling with an infant is also available here. 40 K None No Power Seat 40 K is a standard Economy Class seat located at a bulkhead and might have additional legroom. There is no floor storage for use during take-off and landing. The tray table is in the armrest making the armrest immovable and slightly reducing seat width. A bassinet for a passenger traveling with an infant is also available here. 41 A None No Power Seat 41 A is a standard Economy Class seat that may be purchased as part of the Family Couch option. The Family Couch is formed with this seat, the two adjacent seats, and their extended leg rests to make a comfortable sofa-like bed. 41 B None No Power Seat 41 B is a standard Economy Class seat that may be purchased as part of the Family Couch option. The Family Couch is formed with this seat, the two adjacent seats, and their extended leg rests to make a comfortable sofa-like bed. 41 C None No Power Seat 41 C is a standard Economy Class seat that may be purchased as part of the Family Couch option. The Family Couch is formed with this seat, the two adjacent seats, and their extended leg rests to make a comfortable sofa-like bed. 41 H None No Power Seat 41 H is a standard Economy Class seat that may be purchased as part of the Family Couch option. The Family Couch is formed with this seat, the two adjacent seats, and their extended leg rests to make a comfortable sofa-like bed. 41 J None No Power Seat 41 J is a standard Economy Class seat that may be purchased as part of the Family Couch option. The Family Couch is formed with this seat, the two adjacent seats, and their extended leg rests to make a comfortable sofa-like bed. 41 K None No Power Seat 41 K is a standard Economy Class seat that may be purchased as part of the Family Couch option. The Family Couch is formed with this seat, the two adjacent seats, and their extended leg rests to make a comfortable sofa-like bed. 42 A None No Power Seat 42 A is a standard Economy Class seat that may be purchased as part of the Family Couch option. The Family Couch is formed with this seat, the two adjacent seats, and their extended leg rests to make a comfortable sofa-like bed. 42 B None No Power Seat 42 B is a standard Economy Class seat that may be purchased as part of the Family Couch option. The Family Couch is formed with this seat, the two adjacent seats, and their extended leg rests to make a comfortable sofa-like bed. 42 C None No Power Seat 42 C is a standard Economy Class seat that may be purchased as part of the Family Couch option. The Family Couch is formed with this seat, the two adjacent seats, and their extended leg rests to make a comfortable sofa-like bed. 42 H None No Power Seat 42 H is a standard Economy Class seat that may be purchased as part of the Family Couch option. The Family Couch is formed with this seat, the two adjacent seats, and their extended leg rests to make a comfortable sofa-like bed. 42 J None No Power Seat 42 J is a standard Economy Class seat that may be purchased as part of the Family Couch option. The Family Couch is formed with this seat, the two adjacent seats, and their extended leg rests to make a comfortable sofa-like bed. 42 K None No Power Seat 42 K is a standard Economy Class seat that may be purchased as part of the Family Couch option. The Family Couch is formed with this seat, the two adjacent seats, and their extended leg rests to make a comfortable sofa-like bed. 43 A None No Power Seat 43 A is a standard Economy Class seat that may be purchased as part of the Family Couch option. The Family Couch is formed with this seat, the two adjacent seats, and their extended leg rests to make a comfortable sofa-like bed. 43 B None No Power Seat 43 B is a standard Economy Class seat that may be purchased as part of the Family Couch option. The Family Couch is formed with this seat, the two adjacent seats, and their extended leg rests to make a comfortable sofa-like bed. 43 C None No Power Seat 43 C is a standard Economy Class seat that may be purchased as part of the Family Couch option. The Family Couch is formed with this seat, the two adjacent seats, and their extended leg rests to make a comfortable sofa-like bed. 43 H None No Power Seat 43 H is a standard Economy Class seat that may be purchased as part of the Family Couch option. The Family Couch is formed with this seat, the two adjacent seats, and their extended leg rests to make a comfortable sofa-like bed. 43 J None No Power Seat 43 J is a standard Economy Class seat that may be purchased as part of the Family Couch option. The Family Couch is formed with this seat, the two adjacent seats, and their extended leg rests to make a comfortable sofa-like bed. 43 K None No Power Seat 43 K is a standard Economy Class seat that may be purchased as part of the Family Couch option. The Family Couch is formed with this seat, the two adjacent seats, and their extended leg rests to make a comfortable sofa-like bed. 45 A None No Power Seat 45 A is a standard Economy Class seat that may be purchased as part of the Family Couch option. The Family Couch is formed with this seat, the two adjacent seats, and their extended leg rests to make a comfortable sofa-like bed. 45 B None No Power Seat 45 B is a standard Economy Class seat that may be purchased as part of the Family Couch option. The Family Couch is formed with this seat, the two adjacent seats, and their extended leg rests to make a comfortable sofa-like bed. 45 C None No Power Seat 45 C is a standard Economy Class seat that may be purchased as part of the Family Couch option. The Family Couch is formed with this seat, the two adjacent seats, and their extended leg rests to make a comfortable sofa-like bed. 45 H None No Power Seat 45 H is a standard Economy Class seat that may be purchased as part of the Family Couch option. The Family Couch is formed with this seat, the two adjacent seats, and their extended leg rests to make a comfortable sofa-like bed. 45 J None No Power Seat 45 J is a standard Economy Class seat that may be purchased as part of the Family Couch option. The Family Couch is formed with this seat, the two adjacent seats, and their extended leg rests to make a comfortable sofa-like bed. 45 K None No Power Seat 45 K is a standard Economy Class seat that may be purchased as part of the Family Couch option. The Family Couch is formed with this seat, the two adjacent seats, and their extended leg rests to make a comfortable sofa-like bed. 46 A None No Power Seat 46 A is a standard Economy Class seat that may be purchased as part of the Family Couch option. The Family Couch is formed with this seat, the two adjacent seats, and their extended leg rests to make a comfortable sofa-like bed. 46 B None No Power Seat 46 B is a standard Economy Class seat that may be purchased as part of the Family Couch option. The Family Couch is formed with this seat, the two adjacent seats, and their extended leg rests to make a comfortable sofa-like bed. 46 C None No Power Seat 46 C is a standard Economy Class seat that may be purchased as part of the Family Couch option. The Family Couch is formed with this seat, the two adjacent seats, and their extended leg rests to make a comfortable sofa-like bed. 46 H None No Power Seat 46 H is a standard Economy Class seat that may be purchased as part of the Family Couch option. The Family Couch is formed with this seat, the two adjacent seats, and their extended leg rests to make a comfortable sofa-like bed. 46 J None No Power Seat 46 J is a standard Economy Class seat that may be purchased as part of the Family Couch option. The Family Couch is formed with this seat, the two adjacent seats, and their extended leg rests to make a comfortable sofa-like bed. 46 K None No Power Seat 46 K is a standard Economy Class seat that may be purchased as part of the Family Couch option. The Family Couch is formed with this seat, the two adjacent seats, and their extended leg rests to make a comfortable sofa-like bed. 47 A None No Power Seat 47 A is a standard Economy Class seat that may be purchased as part of the Family Couch option. The Family Couch is formed with this seat, the two adjacent seats, and their extended leg rests to make a comfortable sofa-like bed. 47 B None No Power Seat 47 B is a standard Economy Class seat that may be purchased as part of the Family Couch option. The Family Couch is formed with this seat, the two adjacent seats, and their extended leg rests to make a comfortable sofa-like bed. 47 C None No Power Seat 47 C is a standard Economy Class seat that may be purchased as part of the Family Couch option. The Family Couch is formed with this seat, the two adjacent seats, and their extended leg rests to make a comfortable sofa-like bed. 47 H None No Power Seat 47 H is a standard Economy Class seat that may be purchased as part of the Family Couch option. The Family Couch is formed with this seat, the two adjacent seats, and their extended leg rests to make a comfortable sofa-like bed. 47 J None No Power Seat 47 J is a standard Economy Class seat that may be purchased as part of the Family Couch option. The Family Couch is formed with this seat, the two adjacent seats, and their extended leg rests to make a comfortable sofa-like bed. 47 K None No Power Seat 47 K is a standard Economy Class seat that may be purchased as part of the Family Couch option. The Family Couch is formed with this seat, the two adjacent seats, and their extended leg rests to make a comfortable sofa-like bed. 52 A None No Power Seat 52 A is a standard Economy Class seat that might have limited recline. The proximity to the lavatory area might be bothersome. 52 B None No Power Seat 52 B is a standard Economy Class seat that might have limited recline. The proximity to the lavatory area might be bothersome. 52 C None No Power Seat 52 C is a standard Economy Class seat that might have limited recline. The proximity to the lavatory area might be bothersome. 52 D None No Power Seat 52 D is a standard Economy Class seat that might have limited recline. The proximity to the lavatory area might be bothersome. 52 E None No Power Seat 52 E is a standard Economy Class seat that might have limited recline. The proximity to the lavatory area might be bothersome. 52 G None No Power Seat 52 G is a standard Economy Class seat that might have limited recline. The proximity to the lavatory area might be bothersome. 52 H None No Power Seat 52 H is a standard Economy Class seat that might have limited recline. The proximity to the lavatory area might be bothersome. 52 J None No Power Seat 52 J is a standard Economy Class seat that might have limited recline. The proximity to the lavatory area might be bothersome. 52 K None No Power Seat 52 K is a standard Economy Class seat that might have limited recline. The proximity to the lavatory area might be bothersome. 60 D None No Power Seat 60 D is a standard Economy Class seat located a bulkhead that might have additional legroom. The tray table is in the armrest making the armrest immovable and slightly reducing seat width. There is no floor storage available during take-off and landing. The proximity to the lavatory area might be bothersome. A bassinet for a passenger traveling with an infant is also available here. 60 E None No Power Seat 60 E is a standard Economy Class seat located a bulkhead that might have additional legroom. The tray table is in the armrest making the armrest immovable and slightly reducing seat width. There is no floor storage available during take-off and landing. The proximity to the lavatory area might be bothersome. A bassinet for a passenger traveling with an infant is also available here. 60 G None No Power Seat 60 G is a standard Economy Class seat located a bulkhead that might have additional legroom. The tray table is in the armrest making the armrest immovable and slightly reducing seat width. There is no floor storage available during take-off and landing. The proximity to the lavatory area might be bothersome. A bassinet for a passenger traveling with an infant is also available here. 61 A None No Power Seat 61 A is a standard Economy Class seat located in an Exit Row with additional legroom. The tray table and video monitor are located in the armrest making the armrest immovable and slightly reducing seat width. There is no floor storage available during take-off and landing. The proximity to the lavatory area might be bothersome. 61 B None No Power Seat 61 B is a standard Economy Class seat located in an Exit Row with additional legroom. The tray table and video monitor are located in the armrest making the armrest immovable and slightly reducing seat width. There is no floor storage available during take-off and landing. The proximity to the lavatory area might be bothersome. 61 C None No Power Seat 61 C is a standard Economy Class seat located in an Exit Row with additional legroom. The tray table and video monitor are located in the armrest making the armrest immovable and slightly reducing seat width. There is no floor storage available during take-off and landing. The proximity to the lavatory area might be bothersome. 61 H None No Power Seat 61 H is a standard Economy Class seat located in an Exit Row with additional legroom. The tray table and video monitor are located in the armrest making the armrest immovable and slightly reducing seat width. There is no floor storage available during take-off and landing. The proximity to the lavatory area might be bothersome. 61 J None No Power Seat 61 J is a standard Economy Class seat located in an Exit Row with additional legroom. The tray table and video monitor are located in the armrest making the armrest immovable and slightly reducing seat width. There is no floor storage available during take-off and landing. The proximity to the lavatory area might be bothersome. 61 K None No Power Seat 61 K is a standard Economy Class seat located in an Exit Row with additional legroom. The tray table and video monitor are located in the armrest making the armrest immovable and slightly reducing seat width. There is no floor storage available during take-off and landing. The proximity to the lavatory area might be bothersome. 74 A None No Power Seat 74 A is a standard Economy Class seat in the last row of the aircraft. Recline might be limited. The proximity to the galley and lavatory area might be bothersome. 74 B None No Power Seat 74 B is a standard Economy Class seat in the last row of the aircraft. Recline might be limited. The proximity to the galley and lavatory area might be bothersome. 74 C None No Power Seat 74 C is a standard Economy Class seat in the last row of the aircraft. Recline might be limited. The proximity to the galley and lavatory area might be bothersome. This seat might be bumped by crew and passengers passing by from the rear. 74 D None No Power Seat 74 D is a standard Economy Class seat. The proximity to the galley and lavatory area might be bothersome. 75 D None No Power Seat 75 D is a standard Economy Class seat in the last row of the aircraft. Recline might be limited. The proximity to the galley and lavatory area might be bothersome. 75 E None No Power Seat 75 E is a standard Economy Class seat in the last row of the aircraft. Recline might be limited. The proximity to the galley and lavatory area might be bothersome. 75 G None No Power Seat 75 G is a standard Economy Class seat in the last row of the aircraft. Recline might be limited. The proximity to the galley and lavatory area might be bothersome. 75 H None No Power Seat 75 H is a standard Economy Class seat in the last row of the aircraft. Recline might be limited. The proximity to the galley and lavatory area might be bothersome. 75 J None No Power Seat 75 J is a standard Economy Class seat in the last row of the aircraft. Recline might be limited. The proximity to the galley and lavatory area might be bothersome. 75 K None No Power Seat 75 K is a standard Economy Class seat in the last row of the aircraft. Recline might be limited. The proximity to the galley and lavatory area might be bothersome. A wide variety of music and audio selections are available featuring numerous albums, DJ selected music, Mandarin selections, and radio popular songs. More information may be viewed by clicking here. 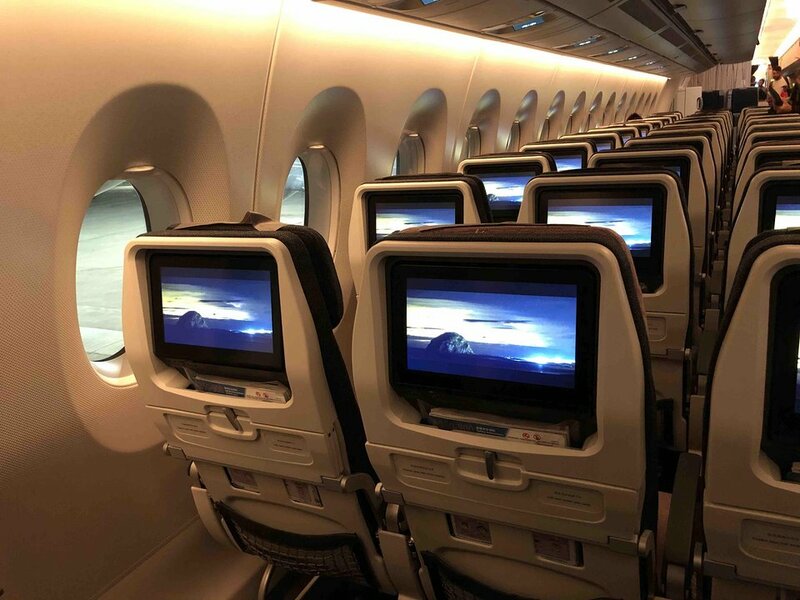 Every seat on the Airbus A350-900 has a video inflight entertainment screen. Over 100 selections of films, several popular television shows, and programs featuring sports, travel, food, music, fashion, culture, and entertainment are available for viewing. More information may be viewed by clicking here. Each Premium Business and Premium Economy seat has an individual AC power outlet. In Economy, power ports are shared between seats. USB powerports are provided at every seat. Wi-Fi service is available on this aircraft for a fee. However, service might be interrupted while flying within territories that prohibit its use. China Airlines provides full service dining on long-haul flights. China Airlines' Airbus A350-900 is the newest and most technologically advanced Airbus jetliner. It is constructed of carbon-fibre reinforced plastic which, due to its lower weight, offers 25% fuel saving over similar jetliners constructed of aluminum and steel. The aircraft features an extra-wide cabin with windows providing panoramic views. 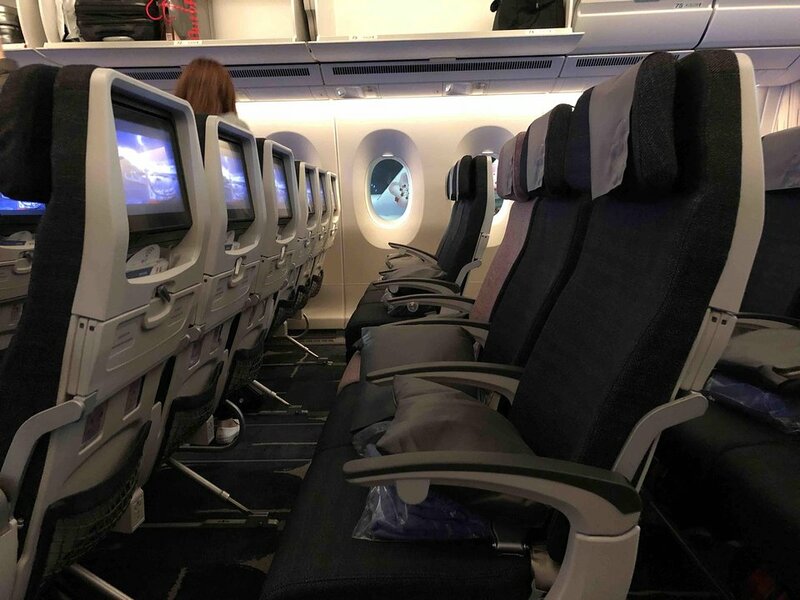 The passenger experience on the China Airlines Airbus A350-900 has been designed to fuse "traditional elements and modern amenities" as mentioned on the company's website. Wooden walls, beautiful fabrics, and dramatic lighting were used in the design of the interiors. Three different classes are on this aircraft. Premium Business, which features open suite seats which convert to fully flat beds, Premium Economy, which features spacious legroom, and Economy, which features comfortable standard seating with access to a variety of inflight entertainment. Family Couch seats, which are three seats together that provide a comfortable bed-like area for children or two adults, are also available in Economy Class. The Family Couch seats are available for purchase at an additional cost. These seats are indicated on the seat map in blue shading. would not recommend this seat. I`m 6`2 and really do not know where to get my legs. Sleep was almost impossible. 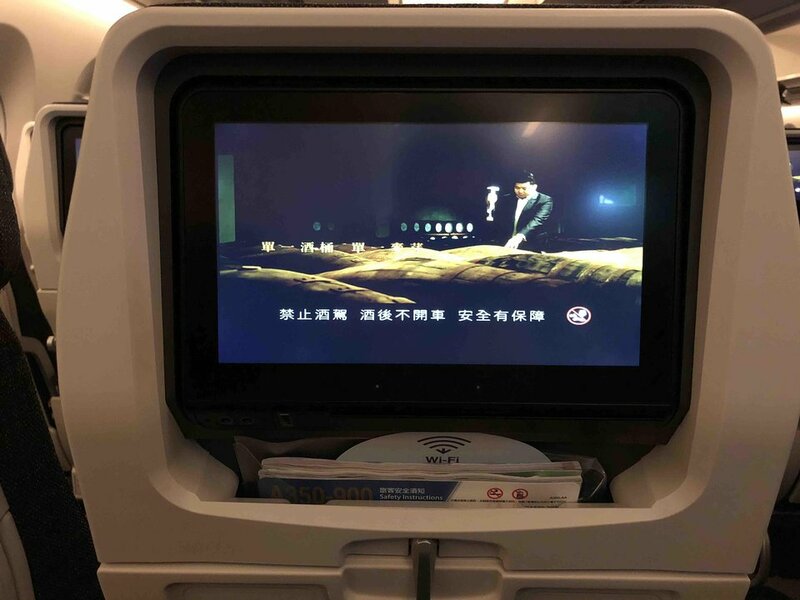 (there are other airlines close to Taiwan who have different types of seat adjustment) and are more comfortable. Anyway, the service was very good and the choices of food good and tasty! The privacy in the premium class is also highly recommended! I dont get why so many people are positive about the Economy in the A350 of CA! I did fly 10h+ to Taipeh and it was a nightmare! The seats are by far not as "soft" as they are on many Emirates Planes, and the seating with is unacceptable! It´s so bloody narrow that you need to be in love with your seat neighbor to stand it! I would go so far to say, that the seats are almost as uncomfortable as they are on many Low Cost Carriers! I will not fly with China Airlines anymore, that`s for sure! Thanks to the naysayers who told me Air China was substandard (not that they'd actually flown with them; their opinions were hearsay), I wasn't looking forward to the flight. Suffice to say Reality:10, Naysayers: 0. The flight was great; I'd rate it 4.5 / 5. Cabin crew, service, food, the seat (almost as good as SIA's business class seat and a lot better than Lufthansa's and United's), cleanliness, and punctuality all spot on. The half-point was lost for the wi-fi (too unreliable to be of any use) and the Sydney and Taipei lounges (reasonable, but more functional than welcoming with okay but not great food). Although this is a premium economy seat, I didn't think it was that much more comfortable than a economy seat due to the limited recline because of the fixed shell seat design, furthermore the bulky airbag in the seat belt was rather annoying. Seat was comfortable for me being a bigger person on the Auckland to Brisbane flight. Very pleasant atmosphere in the cabin, only problem was no choice in meal...chicken or nothing. Great economy class seat! I only flew 3 hours from Auckland to Brisbane, but would have been quite comfortable on a long haul flight in my seat. Good legroom, wide seat, nice cabin. 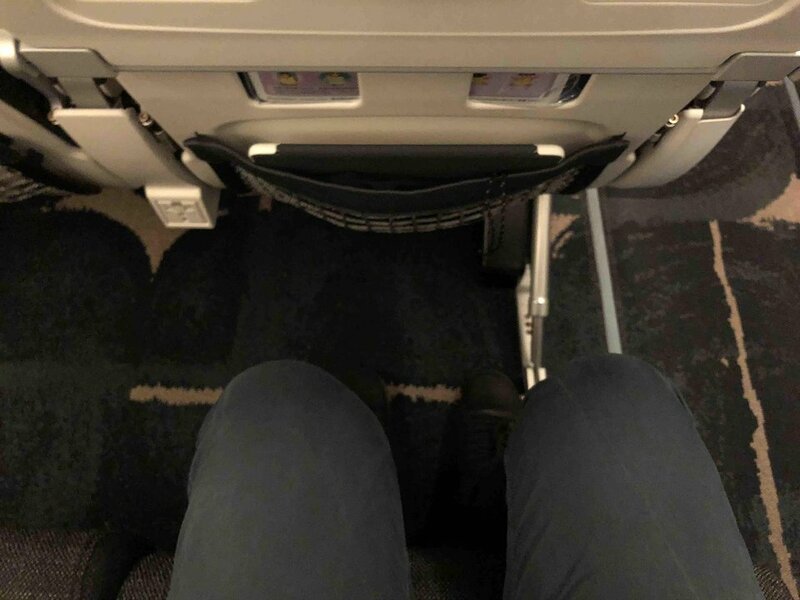 Great economy class seat and I am 6´6 tall and still had a very decent 11 hours flight from Vienna to Taipei. Compared to recent Dreamliner flights this is such an upgrade and feels much better. Seats are not as narrow as on 787 and as the whole seat moves slightly in front when the passenger in front of you reclines, you don´t have limited space in those moments. Only thing you should know about rows 71 and 72 and seats D, E and G: there are no overhead bins available in those two rows. Excellent champagne (Pol Roger Rosé) and wines on my biz class AMS-TPE flight. Seat was larger than what I stuffed myself into last week on Swisss 777 biz cabin, but about the same as Skyteam partner Air France. Food was a little uneven, but the flight attendants were obliging. China Airlines finishes on its A350 are superb  perhaps the best Ive ever seen on an A350. Overall, a pleasant experience. China Airlines Terminal 1 lounge in Taipei is also beautiful. I found the seat to be cramped and uncomforable, with little leg room (I am 178cm). The seat does not recline enough and the adjustable footrest is useless except perhaps for a child with short legs. The old premium eco on the 747 was the former business class seat on that plane and much better. I've flown the A350 premium eco 3 times and didn't sleep at all (Tpe--YVR return). Flew on China Airlines A350 from YVR-TPE, and TPE-YVR in PE class. Quiet cabin, legroom good, seats slide forward. Snacks available in galley. Amenity kit provided, slippers, meals were fine. Impressed with this product. If you book the higher PE fare and are continuing on to BKK for example, you get bumped to business class on that flight normally. Excellent premium economy product. Very comfortable seat with above expectations recline. This is a hardshell seat so the seat actually slides down. 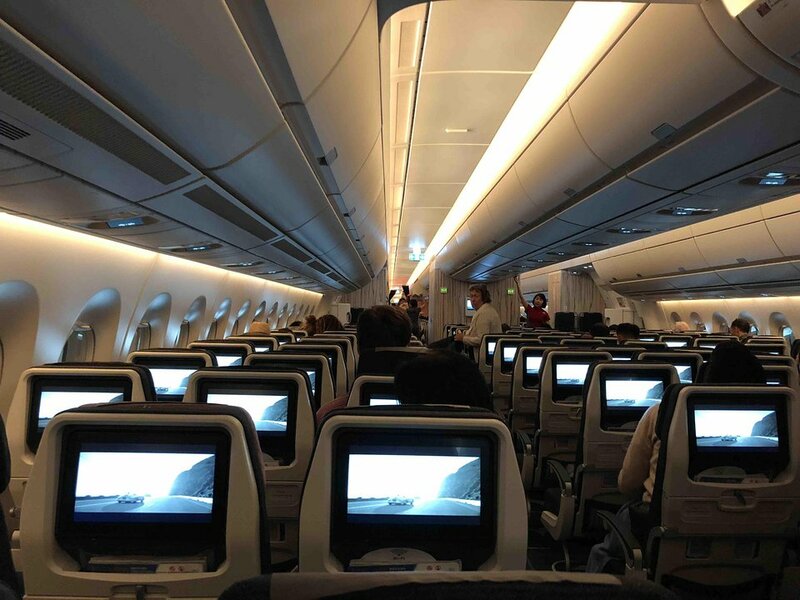 This was a night flight to Amsterdam and I managed to sleep 7,5 hours comfortably. Great value for money. Excellent product for the price. Able to sleep and or enjoy attentive service on SFO-TPE round trip. Plenty of quality eats with flight attendants able to translate the anytime snack labels for the 10% anglos on the plane. Good video/music selection for the long flight. Better proudct at significantly less cost than AA or BA. The exit area will be used by passengers as a waiting area for the toilets and to hang around. Some people might find this uncomfortable. Also there can be a slight issue with smells coming from the toilets. The seats leg space is a bit prohibited as the side of the plane goes inward to support the exit door. Because of this you have to bend your right leg a bit. China Airlines flies 1 versions of Airbus A350-900.